First I must start by saying there are 2 types of people in the world. Those that love Taskmaster and those that don’t have a clue what it is. If you are one of the latter here is a quick explanation. Taskmaster is a comedy panel show that sees Alex Horne set a selection of 5 comedians mad/silly or just plain stupid tasks to see who can perform them best / quickest. These tasks are prerecorded on location and the panellists have no idea how each other have performed until they are shown to the giant Greg Davies (the TASKMASTER himself) and are judged in front of a live studio audience. Taskmaster just showed the final of series 6 before immediately showing the series 7 line up and started the studio recordings within a couple of weeks. Scifind.com had been invited to see the recording of the first episode of Taskmaster series 7. So in addition to the TASKMASTER himself (Greg Davies) and Little Alex Horne (Alex Horne) those being tasked for series 7 are James Acaster (Standup who has been on Mock The Week etc), comedy writer and actress Jessica Knappett (E4’s Drifters, The Inbetweeners Movie), actress and stand-up Kerry Godliman (again many episodes of Mock The Week), internationally acclaimed comedian Phil Wang (BBC Two’s Live At The Apollo, Dave’s Unspun with Matt Forde), and renowned Welsh comic Rhod Gilbert (BBC Two’s The Apprentice: You’re Fired). 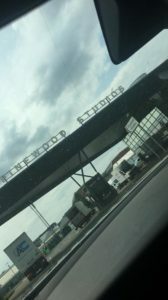 So yesterday, Thursday 19th July 2018, we set off to the world class movie (and TV) studios at Pinewood. Pinewood Studios is a destination in itself, being the home to many a James Bond, Star Wars and many more. It was a fantastic feeling to pass through those gates that have been used by cast and crew of so many great movies in the past. There were loads of curious and helpful security staff who aided us in finding our way, but who wouldn’t have loved the opportunity to wonder around and poke their nose in the hundreds of buildings and rooms on site. The next bit is a little note to self. When you know that you are going to anywhere that is likely to have metal detectors and security searches clear your pockets first. In addition to about £13 in change (seriously who has that much coinage on then, in a pocket, EVER) here is a quick snap of SOME of the contents. 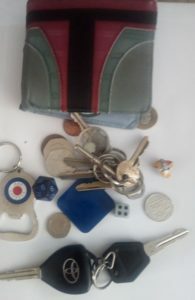 (Do I get geek points for the Boba Fett wallet and the dice?). Seriously I kept emptying my pockets and still kept setting off the metal detector. It took three or four rounds until I was cleared and could sheepishly refill my pockets. So what should you expect from Taskmaster Series 7? Boxes, Beans and the Bear. Well I am not really looking to make any spoilers, though I have made a small hint in the heading above. It is fair to say the show’s format has not changed. Again if you are not familiar with the show you can catch up on all previous series on UKTV Play. It is always a joy seeing what you would presume to be fairly stable people losing their mind over what could be quite simple tasks. With the solutions running from over thinking, to complete breakdown. These ‘simple’ challenges do really stress out the competitive contestants. The mix of comedians is great and I am sure that we will see the dynamic pick up as the series progresses. Thought there are glimpses of how things will progress. For example James Acaster being the baby of the piece and a bit of a ‘love hate’ thing going between Phil Wang and Rhod Gilbert. 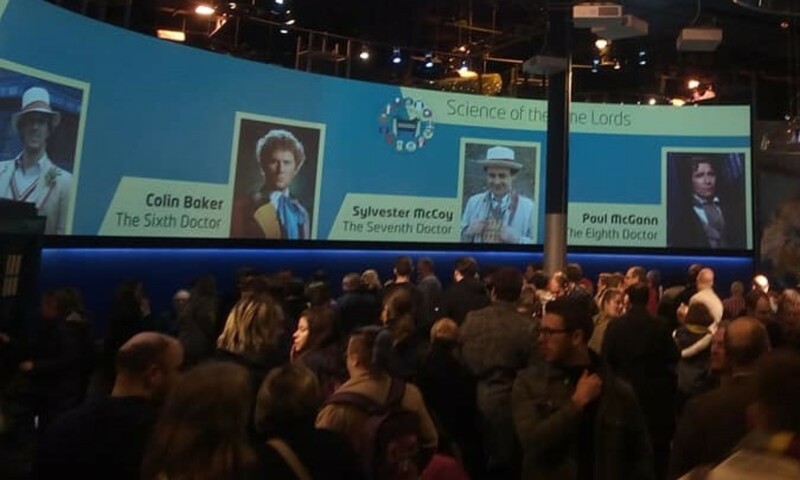 With regards to the actual content of this first episode, I am sure that there is a LOT that we sat through in hysterics that will never make the actual TV show, but this is the same for any. Maybe DAVE should release a Too Hot For TV late night special! As a side note, if you haven’t already, it might be worth watching Greg Davies live show You Magnificent Beast (currently available on Netflix). 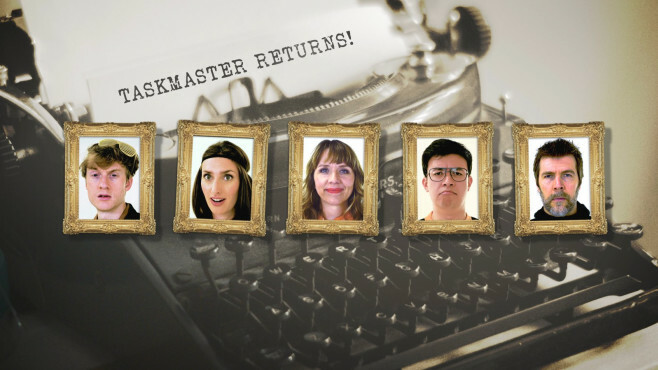 Not only is it a fantastic show in itself, but it will give you a big insight to an element of this first show of Taskmaster Series 7. Big Thank you to all of UKTV, especially Gem. Taskmaster Series 7 should be broadcast on DAVE TV Channel from November 2018.